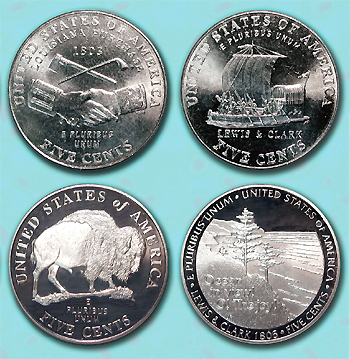 Commemorating the Lewis and Clark expedition of 1804-5, the Mint released two different Jefferson nickels in 2004  the first depicting the "handshake" of early peace medals, and the second Lewis and Clark's keelboat (shown in uncirculated condition, top). This year will bring two more versions, starting with the new American Bison design that was released Feb. 28, to be replaced in late summer by a view of the Pacific Ocean as Lewis and Clark might have seen it (shown in proof condition, bottom). In addition to the new reverse designs, the obverse of both 2005 nickels features a new portrait based on a French sculptor Jean-Antoine Houdon's 1789 marble bust of Jefferson, together with the word "Liberty" in Jefferson's own handwriting (at left, below). he Jefferson nickel made its debut in 1938 in honor of Thomas Jefferson's 200th birthday. It remained unchanged in design until 2004. To commemorate the role Jefferson played in the Louisiana Purchase and the Lewis and Clark expedition of 1804-05, two reverse designs were released in 2004 with minor changes to the obverse (the front). One showed the design of an Indian peace medal. This device was taken by expeditions into Indian territories to present to chiefs as a sign of peace and friendship. The custom began during colonial days. The other showed the territory covered by the Lewis and Clark expedition. This year, two more reverse designs are being released; so far, the buffalo reverse has been issued. A second reverse is due later. The West coast end of the Lewis and Clark expedition was Portland, Ore. In honor of that event, the city of Portland put on a mini-world's fair in 1905 celebrating the western end of the expedition. The fair lasted only four months and featured several buildings, including the largest log building ever erected. Several souvenirs of the Lewis and Clark Fair were issued, including a pair of medals, souvenir booklets, flyers and entry tickets. The much larger and longer-lasting 1904 World's Fair in St. Louis honored the Louisiana Purchase, primarily  and secondarily, the Lewis and Clark expedition, which helped map the new territory and lay out travel routes for trails and eventually railroads. The 1904 fair was marked with a set of commemorative postage stamps, as well as various medals. The U.S. Mint released a pair of gold $1 coins dated 1903 in honor of the Louisiana Purchase. It also issued a pair of gold dollars in 1905, one featuring Meriwether Lewis and the other William Clark, to coincide with the Portland Exposition, honoring the men on their historic expedition. The new nickels are commemorative coins but are minted for general circulation  which means they do not have to be ordered from the Mint, and they are sold at face value. Ask your local bank for a roll of new nickels, and chances are, you'll receive one of the four new Lewis and Clark commemoratives. Unlike other commemoratives, which are usually half dollars, silver dollars and gold coins, these coins will be minted in quantities similar to regular issues. For details of the Portland Exposition, read the article in the March 2004 edition of The Numismatist by Jim Hunt and Jim Wells. It details the 1905 fair and illustrates some of the souvenirs of the fair, including the privately minted gold 25-cent and 50-cent tokens showing Mt. Hood, just east of Portland.